It has been five years since we last reviewed spotting scopes and, as with binoculars, a proliferation of fine optics now competes for birders’ attention—as well as their credit cards. Even with 36 scopes in our arsenal, a quick check of some birding web sites told us that even more choices are available to shoppers. But the models sent to us by scope manufacturers represent a fair cross-section of the market, especially in the high-end categories. As box after box of coated glass arrived in Living Bird editor Tim Gallagher’s office, it became clear that a side-by-side comparison of all the scope models would be challenging. (Just finding enough tripods for our review was a trick in itself.) 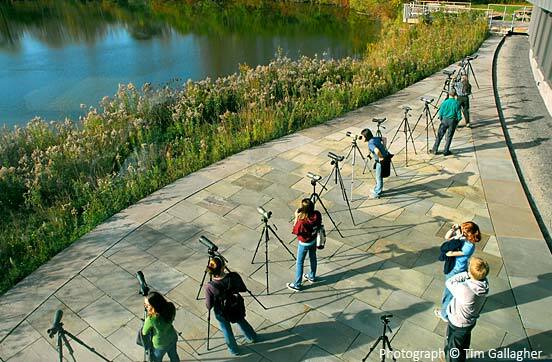 But on several fine October afternoons, 30 local birders, ranging from seasoned World Series of Birding veterans to curious beginners, stopped by the back patio of the Cornell Lab of Ornithology to check out our lineup and fill out a data sheet for the models they examined. Conditions ranged from bright sun to dreary drizzle (not hard to come by in Ithaca), enough variation to put even the toughest scopes to the test. I ended my last scope review with two challenges to optics manufacturers. The first—creating the ultimate birding scope that could provide a flawless image at powers exceeding 75x in a rugged, portable body—has not been met. Although the number of excellent choices is somewhat greater, the finest available zoom scopes have changed little in overall design or performance in the last five years. My second challenge—to deliver decent high- power optics to birders on a budget—has been partially met by several companies. But although we were pleased to see a few inexpensive scopes offering passable images in birder-friendly, waterproof packages, we’ve seen nothing in the scope world like the wide selection of good, low-cost binoculars currently available. The first decision a would-be scope buyer needs to make is often budgetary. As with any fine toy—I mean tool—the cost of a spotting scope is usually the best indicator of its overall quality, so my first recommendation is to spend as much as you can afford, matching up the highest quality scores in the accompanying table with the price you are willing to pay. Keep in mind that the more expensive models are nearly always rugged, fully weatherproof, and come with a lifetime warranty that adds value to your investment. Many of the less expensive scopes offer a good image at lower powers (15x–20x) but often lose quality rapidly as you zoom to higher powers. In contrast, most of the top-of-the-line models provide a sharp, bright image at 60x or beyond. Some birders always prefer a fixed-power (usually 30x wide-angle) eyepiece, while others (including yours truly) find a high-power zoom eyepiece indispensable for tough distance birding situations such as hawk watching, sea watching, or sorting through shorebirds on a mudflat. For this review, we compared scopes fitted with a 20x–60x zoom eyepiece, or the closest equivalent. If you’re on a tight budget, however, and high power is not essential, choosing an inexpensive scope with a fixed, low-power eyepiece might be the best option. Other than image quality, selecting among the many variable scope features usually comes down to personal preference or experience. Because of the high degree of subjectivity exhibited by our reviewers, I cannot emphasize enough the importance of testing a scope in person to make sure it works well for you before opening your wallet. For starters, many scopes come in a straight- through or angled design with virtually identical optics. Whereas the straight models may make it easier and faster to get on distant birds, especially in flight, birders who share their scope with other birders of different heights find the angled design a real asset. When I’m birding with my family, for example, or leading a birding tour, I can simply set the height of the tripod to suit the shortest member of the group (often me!). In addition, many angled scope bodies can be rotated to allow easy viewing below eye-level (such as from a tower or high bluff) without needing to lower the tripod. Many scopes also now come in larger (usually at least 80mm objective lens) or smaller (usually 60mm or 65mm) models, which are otherwise very similar in optical quality. Here the tradeoff is weight and portability (my 65mm Swarovski fits nicely into my small backpack) versus the noticeably brighter image (but not necessarily wider field of view) offered by the larger models, especially at high power in dim light. If (like me) you wear eyeglasses while birding, the most important feature of a scope may be eye relief, or how close you can get your eye to the lens. Fortunately, most newer scope models provide adjustable turning or locking eyecups and adequate eye relief even when zoomed to high power. Pay very close attention to the “eyeglass-friendliness” scores in the table, however, because some scope models give an unacceptably narrow “tunnel” view for eyeglass wearers, especially when zooming. The severity of this tunneling effect varied greatly among our reviewers, depending on how close to their eyes they normally wear their eyeglasses. If you wear eyeglasses, it is especially important that you test a scope in person before buying it. In the accompanying table, I provide an analysis of each scope model in terms of image quality and usability, based on the scores of at least 10 reviewers. I asked each reviewer to judge the overall image quality (brightness, sharpness, edge-to-edge focus, color) on a scale of 1–5 (with 5 being the best) at low power (usually 20x) and zoomed to highest power (usually 60x, but sometimes 45x). They then judged the overall “feel” of the scope, including ease of focusing and zooming, and reviewers with glasses judged the eyeglass friendliness of each model. Finally, I combined the average score in each category, and ranked the scope models according to this overall quality score in three somewhat arbitrary price ranges: top-of-the-line (more than$1,500), mid-priced ($1,000 to $1,500), and budget (under $1,000). Note that the prices listed are usually the manufacturer’s suggested retail price, but many models may be found at discounted prices at retail outlets or on the Internet. Fifteen models competed in the most expensive category, including twelve conventional zoom scopes and three astronomy “cross-overs” that can be used for both stargazing and birding. Among the conventional scopes, the surprising (to us) and virtually unanimous top-of-the-line ranking went to the Kowa TSN-883 Prominar. More than a decade ago, Kowa revolutionized scope birding with the fluorite TSN-4 series, and they seem to have done it again with both the 883 and the slightly smaller 774, which is non-fluorite but boasts the newest “XD-coated” glass. In side-by-side comparisons with Swarovski, Leica, Zeiss, and Nikon, both Kowa scopes provided a slightly, but noticeably, brighter and crisper image at 60x than any other scope. The three-dimensional detail visible on bird feathers and tree bark with these scopes, even in dim light, is simply phenomenal. One evening, as we were packing up from an afternoon of scope testing, a call came in about a rare Hudsonian Godwit at a local wetland. I grabbed the Kowa 883 and headed over in the fading light. As I arrived, not only had the godwit just flown, but a steady drizzle had started. Still, several fellow birders were lined up scoping the ducks and geese with their coveted Swarovski, Zeiss, and Leica scopes—just the “real-birding” test I needed for the new Kowa. Sure enough, the Kowa 883 pulled out considerably more detail on the mergansers and teal at 60x, as if computer software in the scope had somehow brightened and sharpened the image, compared with the other scopes. On another day, three “grayish” shorebirds on a jetty several hundred yards across Cayuga Lake were barely resolvable through the heat waves with the other top scopes, but through the Kowa, two Dunlins and a Ruddy Turnstone were clearly identifiable. Besides the superb image, the Kowa scopes offer other nice features for birding, including eyecups that turn and lock in several intermediate positions and dual top focus knobs that are smooth, precise, and fast, moving from close vegetation to the distant horizon in less than half a turn. Based on the opinions of most reviewers, close behind the Kowas were the Swarovski 80mm and 65mm HD scopes. The bright, edge-to-edge sharp image of both models is only slightly less superb than the Kowa’s, and many reviewers preferred the lightweight compact design of the Swarovskis, as well as the single, full-barrel focus ring. Surprisingly, even the 65mm Swarovski offers a wider field of view than either Kowa scope, but the 60x image of the small Swarovski is noticeably darker in dim light, and some eyeglass wearers experienced slight “tunneling” compared with the larger scopes. In addition, Swarovski still corners the market on what I consider the most innovative scope feature— a built-in tripod mount that’s molded to the body and fits snugly in most Bogen tripod heads without the need for an adaptor plate. This feature permanently eliminates any annoying play or wiggle of the scope on the tripod, a tremendous boon while scanning or digiscoping. All in all, I’m not sure I’m ready to give up my 65mm Swarovski, although I’d love to see one of the smaller 66mm Kowas, which were not sent to us to review. Continuing to split hairs among the excellent top contenders, the Leica, both Zeiss Diascope models, and the Optolyth TBS 100 were in a tier slightly below Swarovski or Kowa. Leica was hesitant to send us their recently discontinued 77mm APO scope, because they are introducing a completely redesigned line of scopes next spring that promises to be very exciting, but they were not yet available for testing. Fitted with a 30x wide-angle eyepiece, the Leica has long been a favorite among professional tour-guides, but zoomed to 60x its image is distinctly duller and darker than the other top scopes. The Zeiss Diascopes provide a very wide field of view at low magnification, but the image is somewhat out of focus around the edges at the lowest power. This could cause eye fatigue while scanning at low power. In other ways, however, the Zeiss scopes were comparable with the other top models. The 60x image on the 85mm Zeiss Diascope was similar to that of the Swarovskis. But the smaller Zeiss scope only zooms to 45x, and the dual focus knobs were somewhat stiff. The behemoth Optolyth 100 only comes into its own in extreme low-light conditions, so it may not be worth its weight— or price—for most birding situations. Rounding out the most expensive category were the Nikon Fieldscopes and the smaller Optolyth models. Nikon says that their scopes were designed “with the birder in mind,” and optically these scopes are sharp and bright, but their design is not as user friendly as some of the other scopes—especially for birders who wear eyeglasses. The focus ring is stiff, and the narrow ring on the zoom eyepiece is hard to find and turn and even harder to read. Worse still for eyeglass wearers is the pinhole of an objective opening that creates tunnel views, even at lower magnification. But because the Nikon Fieldscopes are easy to find at discounted prices, they may offer the non-bespectacled birder an excellent image at half the cost of the other top scopes. By comparison, the smaller Optolyth models were less impressive optically but were easier on eyeglass wearers. For many years, a birder or professional tour guide who demanded the absolute finest scope image available simply had to own a Questar. But the Questar Birder Scope has changed little since the 1960s, and although its image is still excellent, it is easily equaled or surpassed by the top zoom spotting scopes for a fraction of the cost. The same is not true of the TeleVue 85mm Evergreen scope, which continues to offer the most breathtaking optical image available anywhere on this planet. Fitted with an eyeglass-friendly 8–24mm Radian eyepiece, this scope received a perfect score for image quality throughout its 25x–75x range. As fine as the 60x image of the Kowa 883 appeared next to the other conventional scopes, when reviewers put the Kowa next to the TeleVue, their jaws dropped in amazement. As dusk fell and Canada Geese settled almost invisibly onto Sapsucker Woods pond, the TeleVue resolved the same crisp feather detail at 75x as the Kowa could at 60x, and when we backed the TeleVue down to 60x, it was as if a light had been turned on inside the scope. After I raved about the TeleVue in my last review, the company now offers a number of additional features to appeal to birders. First, the 85mm scope came with a 45-degree-angle prism, which made for more comfortable viewing than the typical 90-degree angle on astronomy scopes. Also, TeleVue has introduced a new 60mm scope for birders, which includes the 45-degree prism, and when fitted with the same 8–24mm zoom provides powers from 15–45x. This scope is comparable in size, weight, and image quality to the best Swarovski or Kowa spotting scopes and may cost considerably less, but many birders balk at the non- waterproof housing, awkward feel, and reversed image typical of all the astronomy crossovers. The final scope in this category, Brandon’s Master Birder, will probably have limited appeal to field birders in spite of a very sharp, bright, comfortable image at 15x. But it would be a nice scope for watching birds at a nature center or backyard feeder. We reviewed eight conventional scopes in the $1,000–$1,500 price range, and several offer very decent optics at a reasonable price. The top three models in this category, the Brunton Eterna 80, Opticron ES 80 GA ED, and Bushnell Elite 20–60x80, are large scopes with nearly identical, very good images at low magnification. Zoomed to 60x, however, the Brunton maintained a slightly sharper image than the others, whereas the Elite’s lightweight, user-friendly design (and deeply discounted prices at many outlets) may make it the preferred mid-priced scope. The other full-sized model, Celestron’s Ultima 100 ED was heavy and not as bright and sharp in comparison. The three mid-priced, 60–65mm scopes we tested were decidedly mediocre and probably not worth a second look, considering the better choices in the lower price range. In a class by itself was the Nikon ED 50 Fieldscope, which at 1.2 pounds offers the only truly compact birding scope with a surprisingly bright, sharp image up to 30x. But don’t consider this scope if you wear eyeglasses, because it suffers from the same kind of tunneling as the larger Nikon zooms. I was pleased to see at least a few good choices among the 11 scopes in the under-$1,000 category. Leading this group was the Vixen Geoma Pro 67, which surprisingly, exhibited the best optical quality of the four Vixen models we tested. Neither the larger 82mm, nor the ED-glass models could match the image of their less expensive sibling, leading us to wonder if the scope was mislabeled—or if quality control is an issue. Nevertheless, the sleek, lightweight Pro 67 produced a superior image at low and high (48x) magnifcation than the equivalent Minox, Pentax, or Leupold models, which cost significantly more. An even nicer surprise was the Vortex Stokes Sandpiper, which at $359 or less could be the best buy of any model we tested. This small, lightweight scope is fully waterproof, works well with eyeglasses, and provides an image nearly as nice up to 45x as the more expensive Vixens. The two bulky Vortex Skyline 80 models were definitely outclassed by all of the Vixens and the Sandpiper, with the ED glass version barely improving image quality. Nikon’s Prostaff 82mm scope is similar to the larger Vixens in terms of optical quality but exhibits the same usability and eye-relief problems as the other Nikon zoom scopes. Brunton’s 50mm Eterna and Leupold’s 80mm Sequoia scopes scored lower than the Vortex Skylines, but at the bottom was the Carson SS-550, which would not come into sharp focus even at the lowest magnification. I doubt if you could spot a bull elk in a meadow with that scope. With so many fine scopes on the market, choosing the right one should be easy and fun. Your selection should be based on budget— how much you can really afford—and the kind of birding you do most, or hope to do more of with a new scope. If you’re on a tight budget and want decent optics in the least expensive package, I’d try the Vortex Stokes Sandpiper. For a bump up in image quality in a still-affordable, user-friendly scope, I’d check out the Vixen Geoma Pro 67 or look for a discounted Bushnell Elite. I’d also check out a few other inexpensive scopes that we didn’t get to test this time, such as the Bushnell Legend or Spacemaster or the smaller, non-fluorite Kowa models; several Alpen, Barska, and Zhumell scopes look interesting as well. If you’re willing to spend $1,000 but not much more, the Brunton Eterna 80 might be a good choice, or if you’re really looking for a very light, compact birding scope, and you don’t wear eyeglasses, check out Nikon’s ED 50 Fieldscope. For birders willing to take the plunge for the very best optics at whatever cost, the top choices, in my view, are either the Kowa 883/884 or 773/774 or the Swarovski HD 80mm or 65mm scopes. Any of these top scopes will give you years of pure birding pleasure. Although the larger Kowa offers the brightest, sharpest image available from a conventional zoom scope under the toughest birding conditions, the small Swarovski still delivers the best image per ounce of any scope. Since I started using a Swarovski HD 65 five years ago, I find that I readily take it to places—such as the canopy of a Peruvian rainforest—where I would never consider lugging a larger scope. Again, I urge you to try these scopes, in the field if possible, to see which model works best for you. I would check out the smaller Kowa XD models as well, and if you’re a Leica fan it might just be worth waiting till spring to see if their new line can recapture top billing. Finally, if you are a connoisseur of “pure image” and you have a sheltered location to set up the TeleVue 85mm Evergreen scope (a covered deck overlooking the ocean comes to mind), you will not be disappointed. And although the more portable 60mm scope package is a step in the right direction, my challenge is still out there to put the unparalleled TeleVue optics into a waterproof, truly birder-friendly spotting scope that can set a new standard for extreme birding. . Ken Rosenberg is director of Conservation Science at the Lab. Now that you’ve found the scope of your dreams, it’s time to put those observations to use! Keep track of the birds you see on eBird. What is eBird? Find out more here. Already using eBird? Log in here. We want your comments and suggestions, so that we can improve your experience online and in print.